Crew training for 'Marswalk' at the simulated martian terrain of the Mars500 experiment. The terrain, about 10 m long and 6 m wide, is covered with reddish sand and is built to resemble the surface at Gusev crater. On the ‘surface’, they conducted simulated scientific research by driving a rover and working with sensors to gather physical and chemical measurements. Scientists planning a four-month mock mission to Mars in 2013 have received about 700 applications from aspiring "astronauts." But only six lucky volunteers will make the final cut. The project, which will study how to feed space travelers during a months-long trip to the Red Planet, is set to take place on the big island of Hawaii. The deadline for applications was Wednesday (Feb. 29). Project researchers are looking for six volunteers (and two backups) to live in a simulated space capsule and pretend they're astronauts for 120 days. That proposition apparently sounded great to the hundreds who applied. The mission, called HI-SEAS (Hawaii Space Exploration Analogue & Simulation), will study how peoples' food preferences change over time, especially in confined spaces with little variation and a lack of fresh foods. Study volunteers will eat a combination of prepackaged meals as well as foods they prepare and cook themselves from shelf-stable ingredients. They'll fill out daily surveys on their food intake, likes and dislikes, as well as general mood and health information. 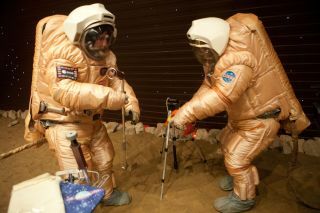 The mock astronauts will live lives very similar to the real thing, communicating with people on the outside only through time-delayed electronic means, and leaving the facility only when fully suited up in "space suits." And the requirements for HI-SEAS participants are not much different from the credentials necessary for real astronauts. Applicants for the new project must have a bachelor's degree in engineering, math or science, at least three years of grad school or professional experience, and the ability to pass a Class 2 flight physical examination. Those selected will be able to work on their own research as well as the mission objectives. They'll also receive $5,000 if they complete the project, as well as travel and expenses. Some HI-SEAS hopefuls are blogging the process of applying. One, named Timothy Judd, compared the prospect of a mission to Mars to the early explorers who first sailed across oceans to discover new continents. "Space travel is this generations[sic] ocean and we can sit on the sideline and say, 'don’t go, you might sail right off the edge,' or you can help build the boat," Judd wrote. Another, Joshua Nelson, said that communicating about the process of applying, as well as the mission itself, will be a vital part of the project. "If selected, it is my goal to make HiSEAS the most connected analog yet, despite the time delay!" Nelson wrote. The HI-SEAS directors must now start whittling down their stack of applications. "The selection committee will choose about 30 semi-finalists," Binsted said. "The semi-finalists will be asked for references, and to get a class 2 flight medical. We will then conduct phone interviews, and select the eight finalists." Those finalists will then be invited to a training workshop at Cornell University in the summer of 2012. There, the scientists will evaluate the finalists' taste and smell acuity, communication abilities, and capacity to learn new scientific and culinary skills, to determine which six will be the primary crew members. HI-SEAS isn't be the first analogue Mars mission. The European and Russian space agencies conducted another simulated journey to our planetary neighbor in 2011 called Mars 500. This project put six "astronauts" inside a faux space capsule for 500 days to investigate the physical and psychological challenges of keeping a group of people confined in a small space for an extended period of time. While Mars 500 was the longest mock space mission conducted, other projects have sent participants to the desert, Antarctica and even deep under the ocean to simulate the experience of traveling through space.